Access control can be used in a variety of different ways from a lock on a car door, to a PIN on an ATM system, to a door control reader granting or denying access to a building. In the door control industry, a credential, such as a badge containing an RFID tag, is presented to a reader. The reader sends the information to a control panel, a highly reliable processor, and compares the credential’s information to an access control list and either grants or denies that person access to the building. Within these access control applications there is a need to bridge the serial communication of the door controller into the network. 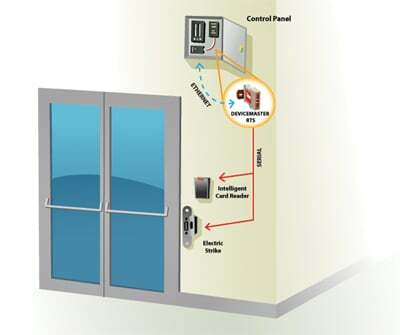 Comtrol’s DeviceMaster® RTS takes the serial information from the door controller, converts it and communicates to the control panel via Ethernet. Companies depend on reliable and accurate access control to provide the safety and confidentiality that they need for their employees. The DeviceMaster RTS makes a good fit for door control applications because of its software-selectable RS-232/422/485 communication modes, ease-of-use and reliability. If you are looking for more infomation on Comtrol products click on the link below.